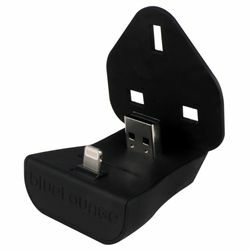 The MiniDock allows you to charge your iPhone® or iPod® player without the need for cumbersome cords. Holding your device upright and secure, MiniDock plugs directly into your existing Apple USB power adapter, freeing up counter or tabletop space. The all-digital Lightning connector features an adaptive interface that uses only the signals that each accessory requires. It is reversible so you can instantly connect to your accessories. UK Version.